This crispy crunchy salad is so delicious and hard to stop eating (I always want seconds!). 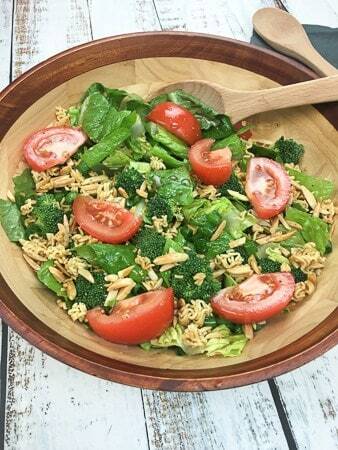 I’m not sure which is my favorite part of this salad, the crispy crunchy romaine, broccoli, slivered almonds, and ramen noodles or the salad dressing (oh this salad dressing is the bomb). When all these ingredients come together, what a delightful flavor and texture experience! Even my husband, who is a ranch dressing person, ate two huge bowls of this salad! This quick and easy salad recipe only takes minutes to prepare. The toasting of the slivered almonds and Raman noodle pieces takes the longest; only about 5-8 minutes. Wash a head of romaine lettuce then tear into bite-size pieces. Chop one bunch of fresh broccoli into small florets. Cut 4 green onions with a pair of scissors. Place these ingredients into a large salad bowl (I like to use a wooden salad bowl; so pretty). Toast slivered almonds with Raman noodle pieces (you can throw away the seasoning packet that comes with the Raman noodles, or save it for something else) in the oven. While these ingredients are toasting in the oven, combine oil, sugar, vinegar, and soy sauce. You can use a clean, empty salad dressing bottle or a mason jar. When ready to serve the salad, toss the salad mixture with the dressing. Prepare to be blown away, lol. 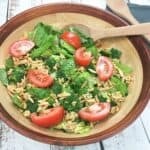 Crisp romaine lettuce, fresh broccoli, and ripe tomatoes are tossed with crunchy toasted slivered almonds and Raman noodles then topped with a sweet, tangy homemade salad dressing. Preheat oven to 300F. Break the Raman noodles into small pieces and add to a sheet pan with the slivered almonds. Pour melted butter on top and toss to evenly coat the noodles and almonds. Bake for 5-8 minutes until slightly browned. Remove from oven to cool. Mix the oil, sugar, vinegar, soy sauce, and black pepper in a small container. Place the lettuce, broccoli, green onions in a large salad bowl. Add the browned Raman noodles and almonds. If you try this recipe and like it, let me know! I’d love to hear from you! Try Crunchy Romaine Toss Salad with my Best of the Best Meatloaf! This is a quick weeknight dinner idea! We’ve been incorporating more salads into our routine, I need to try it. (pinning for later). Thanks Erin. We love this salad and hope you do, too! Let us know.